Almost three years after 2013’s “Plastic Makes Perfect”, AYRIA strikes hard again with release number five. AYRIA is now a 12 year scene veteran and Jennifer Parkin has proven her sonic style and exploration into the darker side of alt-pop is here to stay. AYRIA, an established icon of female club industrial music, mashing pounding beats, aggressive synths, with melodic female vocals, stays true to her roots on this release diving back into the slick electro sound that started AYRIA in 2003, while continuing to evolve the sound to appeal to modern listeners. Canadian singer & songwriter Jennifer Parkin, teamed up once again with heavyweight producer Sebastian R. Komor. Their artistic chemistry to produce the kind of unique alternative electro-pop that sounds both big, gritty and beautiful all at once, continues to capture new breeds of fans around the globe. The founding fathers of American goth rock, It is undeniable that Christian Death has made a major mark on the international gothic and death rock scenes and has produced some iconic records. They have set themselves up to shock, wallowing in blasphemy, morbidity, drug use, and sexual perversity. The band dubbed its sound "death rock”, however, their sensibility was ultimately similar enough that the "goth" designation stuck in the end. Their music has relied on slow, doomy, effects-laden guitar riffs and ambient horror-soundtrack synths, and influenced by British glam rockers like David Bowie and Roxy Music, as well as industrial provocateurs Throbbing Gristle. Over 30 years and 15 albums, they are back with “The Root of All Evilution”, a return to form. proving that Christian Death are still relevant and have a place in 2016. Melissa Saurus Wrecks, Michelle Marie, Stephanie, Janeiry, Shaila Kristie, Margie + more! 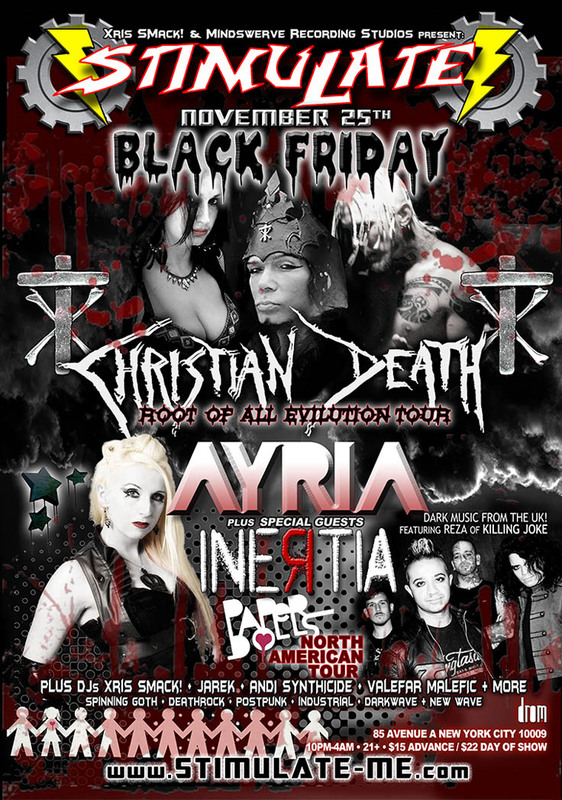 :AYRIA, Christian Death, Deathrock, Goth, Gothic Rock, Industrial, Intertia, Xris SMack!